We'll cut right to the chase: the Synology DS3612xs and QNAP TS-879 Pro are beasts. They were as fast as any NAS device we've tested using a Gigabit Ethernet connection, and they're completely different animals when equipped with a 10GbE network card. For instance, in CrystalDiskMark, the DS3612xs's sequential writes jumped from 114MB/s to 951MB/s. Despite packing a faster processor, the TS-879 Pro was much slower with sequential write speeds of 675MB/s -- still blisteringly fast, mind you. That gap existed through most of our benchmarks, including our file download and upload tests, where the DS3612xs was 20 to 30% quicker than the TS-879 Pro. Nonetheless, both units were impressive, especially when handling smaller file writes as we expected the HDDs to hinder performance more than they did. And again, the 10GbE connection provided massive gains over conventional Gigabit Ethernet. The greatest disadvantage to 10GbE networking, of course, is its cost. You can expect to pay at least $200 per card, in addition to buying an array of 2TB, 3TB or 4TB hard drives. That's on top of the NAS device itself, which costs $3,500 if you opt for Synology's speedier solution and $2,200 for QNAP's. Those figures will discourage most home users, but it's a justifiable expense for business customers. The TS-879 Pro seems to cover all the bases very well. It supports USB 3.0, SATA 6Gb/s and eSATA, while QNAP's latest NAS management software provides tons of features, yet remains easy to use for novices. 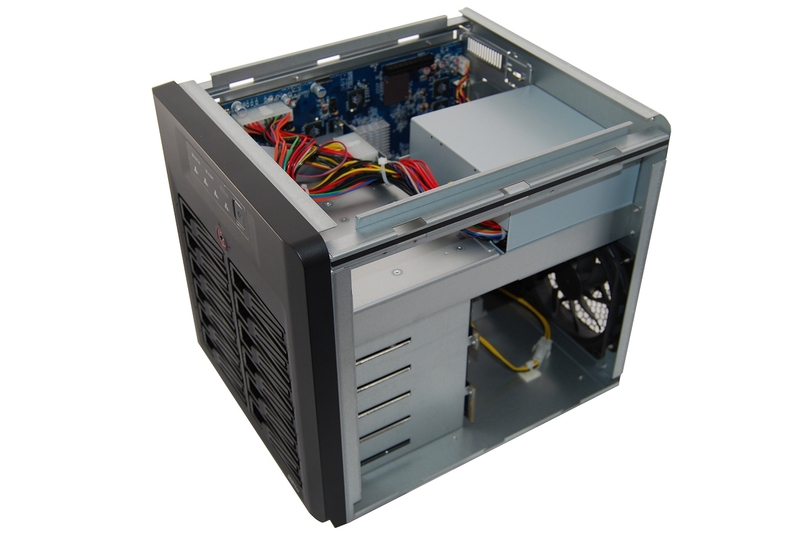 At $2,200, it's probably best for smaller businesses that need fast, but reasonably affordable storage. Conversely, the DS3612xs offers more speed while (disappointingly) skipping over features such as USB 3.0 and SATA 6Gb/s. Synology's DSM 4.0 management software is extremely comprehensive. At $3,500, Snyology's NAS is probably best for operations that need raw power and care less about connectivity. Pros: Great performance and excellent connectivity. Supports USB 3.0, SATA 6Gb/s and eSATA. Software is very complete and user friendly at the same time. Cons: Expensive NAS, but competitively priced for 10GbE. Pros: Top notch 10GbE performance. Up to 12 drives, with option to expand further. Four Gigabit Ethernet ports means two pairs of link-aggregated ports can be configured. Synology software gives you full control over the system. Cons: Costly system that nonetheless deserves full consideration. Lacks USB 3.0 and SATA 6Gb/s support.